For the first time ebooks are available for Do You Know Me, now called Tapiwa's Uncle: Do You Know Me, and The Warm Place. Tapiwa's Uncle includes a chapter that is not in the print editions. 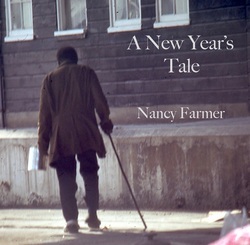 For a short time the ebook of A New Year's Tale will be free. I don't know when (or whether) I will do this again. We are going on walkabout next week. "Walkabout" is an Australian word for wandering without any schedule or destination, my favorite kind of vacation. When you book hotels or campsites you are put on a SCHEDULE and can't take advantage of a perfectly beautiful discovery because you have to move on. Harold worries that we won't find a place to stay at the last minute, but that's why God created sleeping bags. You have all kinds of adventures. Once I camped out on a lovely beach to wake up after the tide came in and I was floating away. Enjoy the ebook. I have just published an adult e-book on Kindle/Amazon. It's called A New Year's Tale. Sometime in the near future, the U.S. government discovers that it doesn't have enough money to cover Social Security and Medicare. Thus are born the new Senior Laws. These are aimed at making sure no one lives much past age sixty-five. The Diminished Culpability Act, for example, states that if you kill someone aged twenty-one, you go to prison for life. But if you kill a seventy-year-old you only get two years in the slammer and for an eighty-year-old you only have to do two weeks of community service. This has alarmed the spirit world, from where our ancestors watch over us. In particular, the old gods of Africa are outraged by the lack of respect given to the elderly. Being spirit, they can do nothing physical, but they can recruit the living. They select five seniors to correct the situation. These five must elude capture and figure out a way to take over the government. The subject is serious, but the story is hopeful, upbeat and wickedly funny. If it does well I will put it out as an actual book. Click on the image to be taken to the Amazon page. My African adventure story, The Ear, the Eye and the Arm, is also available as an e-book on Amazon's Kindle. Click on the image to be taken to the web page.